James Reviews a 16kg kettlebell – James Proclaims! If like me, you have a track record of buying home fitness equipment and not really using it, then this 16kg kettlebell is just what you’ve been looking for. Unlike that enormous weights bench, which sat in your parents’ garage long after you left home, this kettlebell is relatively easy to transport. A cautionary note, it does weigh 16kg, which is quite heavy if you’re travelling on public transport, but it will fit easily into the smallest of cars, which means that relocation shouldn’t stop you from keeping (and not using) your kettlebell forever. 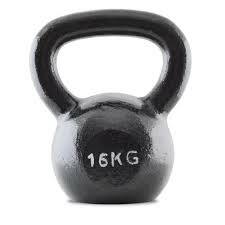 In conclusion, the 16kg kettle bell is better than a weights bench, a cross-trainer and a rowing machine, because it’s easier to store, easier to move and significantly more affordable. Does it actually help you to get fit? I bet you haven’t even BEEN to Missouri, and yet you seem to know about my penchant for equipment, albeit never so large as all that. I currently have a foam roller on the floor, plus a few leg weights. Perhaps this evening…..
You should keep it near your computer and use it in between blogging thoughts. I used it for a inspiration – does that count? But we’re all nice people and isn’t that what really counts (he says between mouthfuls of cake)? ← ‘James Proclaims’ Needs You!